We know exactly what's bothering you here. Booming bass is what brings life to loud sound, and we can't even imagine a situation without its presence. How can we? It's the ground-shaking waves we're talking about! However, the possibility of getting the same vibe from small under seat subwoofers often doesn't seem that convincing, does it? Of course, expecting to get the same response as big subwoofers is quite a dare. But, not an impossible one. Yes, it's true, under seat subwoofers aren't big enough to hold powerful cones, neither do they have the same arrangement. Yet, manufacturers have found ways to pack the same strong bass in them and provide you with your desired response. The problem is that it's a big market and mixed with all sorts of subwoofers. And most of them are not worthy enough to meet your expectations. But since you're here, ending up with a poor item is way beyond all the possibilities. Our goal is to bring you the best under seat subwoofer and you're gonna get the best under seat subwoofer. 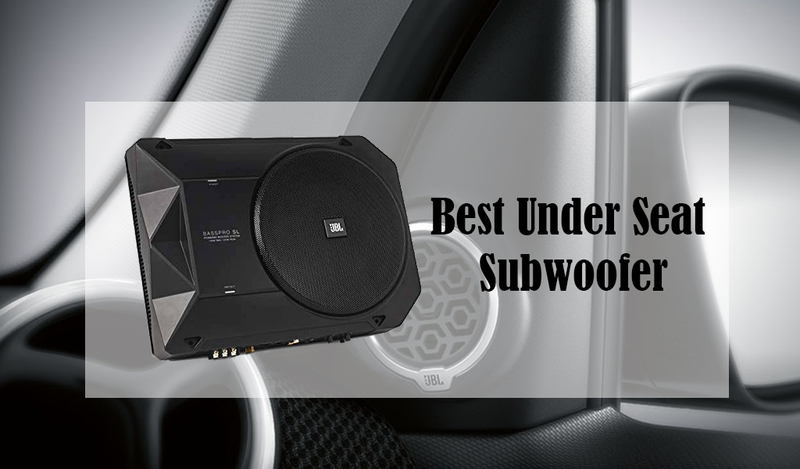 Check out our list of top ten under seat subwoofers and pick the one that suits you the most. Also, in case you have any question regarding the subwoofer or the purchase, you can check out the FAQ section below for answers from industry experts. 1. What are some other best locations for an under-seat subwoofer placement? Ans. Under seat subwoofers usually come in small size since there isn't much room under a car seat. So, space is really not a big deal when it comes to these subwoofers, you can install them anywhere you feel convenient. There is no limitation for them like gigantic subwoofers have. However, considering the path of output transition; car door, back of the seat and trunk are more likely the other best options for the placement. 2. What's the benefit of a powered subwoofer? Ans. Built-in amplifier, of course. You already know the definition of the powered subwoofer, it comes with its own amplifier. When you're using a powered subwoofer, you won't have to link an extra amp with the system for optimized frequencies, the built-in one takes care of that itself. Moreover, powered subwoofer's response sounds more intense. 3. Why it's compulsory for a subwoofer to be connected to an amplifier in general? Ans. We use subwoofers for bass reproduction. More intense output means a much more enjoyable experience. The amplifier takes the signal and amplifies it to go stronger, which results in the louder output. This is the core reason behind the addition of an amplifier. 4. Are all under seat subwoofer powered? Ans. No. Both types are available for your convenience. To save your time, space and effort, powered subwoofers take the amplifier's responsibility on their shoulders. In case, you want a louder response, other subwoofers are always available. 5. What are the cons of inaudible low frequencies? Ans. The term bass is used to refer to the range of low frequencies. The thing is, all low-end frequencies are included in the array, even the inaudible ones. Now, even though some frequencies are inaudible to human ears, they still appear as signals and not quite the necessary ones. Instead, these frequencies contradict with the subwoofer configuration and damage the system. 6. What is a filter? Ans. An important part of the subwoofer, in other words. The low-frequency range consists of a huge number of frequencies, but not all of them are necessary in order to reproduce ideal bass response. Some of them even play as the root reason for distortion. To prevent unnecessary frequencies, filtering is required and this is where the filter circuit comes in handy. It allows only a certain range of signals to pass by and blocks other unnecessary frequencies from getting in the way. 7. What is the difference between high-pass and low-pass filters? Ans. Both circuits work to separate the important frequencies from the unnecessary ones, but differently. Low-pass filter blocks frequencies above a certain setting and the high-pass filter does the complete opposite, it blocks frequencies below a certain setting. 8. What is a subsonic filter? Ans. Another important feature of the subwoofer. The subsonic filter takes care of the inaudible frequencies mentioned earlier. It blocks them from transitioning and makes way for high-efficiency bass. Yes, we decided to cover this part for your utter satisfaction. As a consumer, it's obvious that you'll want to make the right choice. So, we thought it'd be better to open up about our criteria to check if we're on the same track as you. Moreover, this will help you to understand better what you're actually dealing with here. Since we're talking under seat subwoofers here, space has a great impact on the sorting. There's not much room available under the seat and that's why you can't go over a certain length. Now, we haven't mentioned exact ratios in the reviews (except for one particular product's thickness), but made sure to check out the dimensions to pick the best fits. You can rest assured about their size, they're perfect fits. We're aware that your main priority is the bass quality. We took care of that along with the size. Every subwoofer in the list holds incredible arrangement for bass reproduction. All the subwoofers below include their own amplifier. Yes, you can link an amplifier anytime you want for the extra strength, but we decided to eliminate the extra work by adding powered subwoofers. Filters are very important when it comes to subwoofer since one have to deal with inaudible low frequencies, distortion and other damage-causing issues. We selected subwoofers with quality filter arrangement. Some of them include other technologies for protection. We only added subwoofers with remote controls as a direct demonstration of an under-seat subwoofer is pretty complicated. So, there you go, these were our main criteria for selecting the best under seat subwoofer. Judging from the list, it feels like we did a pretty good job. The rest of the judgment is up to you. Check out the reviews for a more thorough insight and pick the one that suits you the best. If you're out of big space and in need of a suitable name, Kenwood KSC-SW11 150W Low-Profile Amplified Car Subwoofer is always at your service. Kenwood is a popular name in thousands of homes due to their quality performance, and the same attitude is reflected in this subwoofer as well. Get rid of giant boxes for the sake of profound bass. It's time for some compact enclosures with the same output. That's right, this is what makes this subwoofer a better choice than most other candidates out there. The little body gets along perfectly in every shallow/small space without causing any trouble. Yes, it's an under-seat subwoofer, but it can be placed anywhere else for your convenience. For instance, you can place it inside the car's trunk or storage area, on the back of the car's seat instead of putting it under, or on the wall, whatever seems to give you the best response. The choice of location is up to you, the performance is up to the subwoofer. And trust me, it's good. How do we know? Well, offering 110 dB sensitivity ain't that much of a child's play. And then check out its power handling limit. 75 Watts of RMS and 150 Watts of peak power! These numbers are already giving you that booming bass vibe, aren't they? And it's a powered subwoofer! Yup, no need to worry about plugging that extra piece of amplifier anymore; it already comes with a built-in one. Just plug and power, and enjoy the rhythm. A wired remote control is included for the user's controlling privilege. You will be able to control the subwoofer's moves right from your seat, or wherever you're sitting inside your car. See? Told you it was a perfect match! 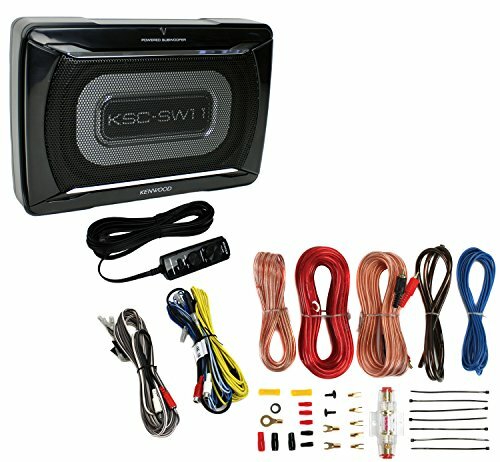 Kenwood KSC-SW11 150W Low-Profile Amplified Car Subwoofer doesn't take much of your space, yet works to deliver pretty promising response when it comes to user demand of quality bass. After all, it's a Kenwood system we're talking about. Everybody bears an ideal picture in mind when they're looking for something; nobody knows what's waiting ahead, yet grabs some random pieces, gathers them in one place and hopes to get something similar in real life. Guess what? Though we can't guarantee you the similar experience for every purchase you're ever gonna make, but this time your luck is just around the corner! Rockford Fosgate P300-12 Punch 300 Watt Powered Loaded 12-Inch Subwoofer Enclosure is definitely the subwoofer piece of your dream and in case it's not, it's because this is BETTER THAN YOUR DREAMS! So, let's get into the features, shall we? It's a powered subwoofer. Yep, no need for an extra amplifier anymore! A class D amplifier is included inside that works with 300 Watts of RMS power. The subwoofer covers a frequency response range of 35Hz-150Hz. The construction is what makes it one of the best powered subwoofers in the market. 5/8-inch MDF material ensures utter durability, while industrial heat activated vinyl coating takes care of internal thermal discharge. This subwoofer uses the sealed enclosure to ensure accurate, profound bass delivery. The combined delivery of the subwoofer and the amplifier sounds much better due to its 'closed-loop' design. 12db/Octave low pass crossover is installed inside. Included thermal and overvoltage protection system helps to keep the subwoofer secured from possible hazards. It comes with 12 AWG input terminals. The features it holds for controlling are pretty awesome. It comes with adjustable bass boost EQ which allows you to equalize the rhythm to match your preference. 0°/180° phase switch is featured for controlling convenience; however, auto turn on/off function is always there for extra assistance. And, let's not forget the remote bass level control that comes along to help you with all your other controlling needs. So, tell me then, isn't Rockford Fosgate P300-12 Punch 300 Watt Powered Loaded 12-Inch Subwoofer Enclosure exactly the subwoofer piece you were dreaming to purchase all this time? It has to be! Guess what? 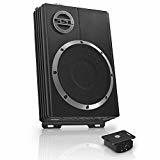 Pyle PLBASS8 8-Inch Super Slim Active Subwoofer is a small under seat subwoofer and it promises to perform BETTER than other larger counterparts. Space? Least of your worries with this speaker. Its low-profile body allows this subwoofer to tag along with all circumstances; under or back of the seat, inside the truck, on the dash, you name it, the 8-inch subwoofer suits them all. With 600 Watts of maximum power, the response is pretty dope. But it offers more. What you won't be receiving from most subwoofers, is this subwoofer's most fascinating attribute. Yes, it allows both high-level input and RCA low-level input. Impressive, isn't it? Green and Red LED indicators are featured to showcase stats of different inputs. The problem of signal distortion is solved with the addition of a low pass filter, which takes care of subsonic responsible for this nuisance. The construction as well has a great impact on its quality. 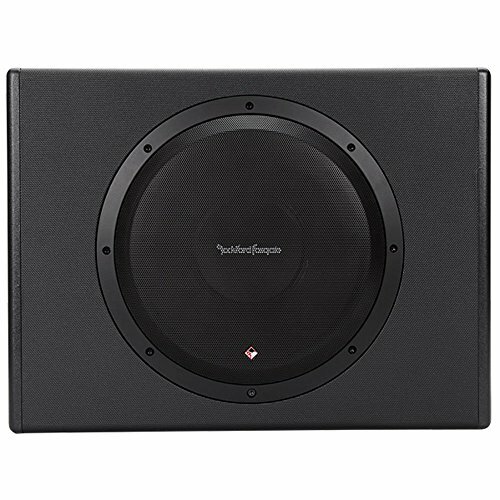 The subwoofer's thermal and overload protection circuit gives it a pretty durable image. You don't have to get off your place to control the system. A remote control is included which allows you to control the subwoofer's performance from your seat. Pyle has always been adored by its users for outstanding performance. So it's pretty evident that Pyle PLBASS8 8-Inch Super Slim Active Subwoofer bears those similar promises as well. Rest assured, you won't regret the purchase. Let's not talk much and get right into the features to show you what a great piece you're dealing with, shall we? The 8" low profile body is perfect for installation in small places, won't take much space in your car. Also, because of this attribute, this subwoofer fits perfectly everywhere. Don't wanna put it under the seat? That's okay, as long as the back of the seat or other places like the trunk is okay for you. It's a powered subwoofer. Yep, loud response without the need of plugging an extra amplifier. The included class A/B amplifier already takes care of everything. However, you can still boost those frequencies by linking an additional amplifier. Since Sound Storm LOPRO8 600-Watt Low Profile Amplified 8 Inch Car Subwoofer supports both high and low-level inputs, you can always add another amplifier for a louder response. Though it won't be necessary, the high-level input is pretty dope on its own. 600 Watts of power, you can assume the strength! Moreover, this subwoofer introduces MOSFET (Metal Oxide Semiconductor Field-Effect Transistors) power supply technology for stronger delivery. The sound is clearer and smoother due to additions of the subsonic filter and variable low pass filter. Again, it includes variable bass boost that lets you adjust the response to match your preferences. For better protection, automatic shut-off technology has been added here. The subwoofer shuts itself off in case of short circuit threats or when the temperature gets out of control. A wired remote control is featured that lets you control the subwoofer from your seat. You can use variable input control in order to adjust amplifier input. So, as you noticed above, Sound Storm LOPRO8 600-Watt Low Profile Amplified 8 Inch Car Subwoofer offers a great deal for your car's stereo system. It takes care of all your subwoofer needs and you get a lot more than one can ask for. Great piece indeed, isn't it? Subwoofers are all about bass and we know what you want, some firing beats that will shake your car, and also your skin. Now, since you have to consider deducting some subwoofer room due to space shortage, the feel of the presence of an actual subwoofer enclosure is often missed out. Pioneer gets how you feel and this is what Pioneer TS-SWX2502 10-inch Shallow-Mount Pre-Loaded Enclosure is all about. It brings that large subwoofer cone vibe even in the shallowest area. Yes, it features an oversized cone inside a compact body, and it's for the user's own benefit. Oversized cone means more room for air, thus the reproduction of louder response. It also includes dual spiders to help with cone's motion stabilization. MICA injection-molded resin has been used in the cone's construction, making it a rigid yet sensitive driver for use. Regarding power handling, the subwoofer comes off as a pretty tough sport. 1200 Watts (300 Watts) of total power handling is evidently more than enough to blow your mind. It covers a frequency response range of 20 Hz to 200 Hz. The design and use of materials on the exterior makes it a perfect system for crucial installation. The enclosure is carpeted and scratch resistant. 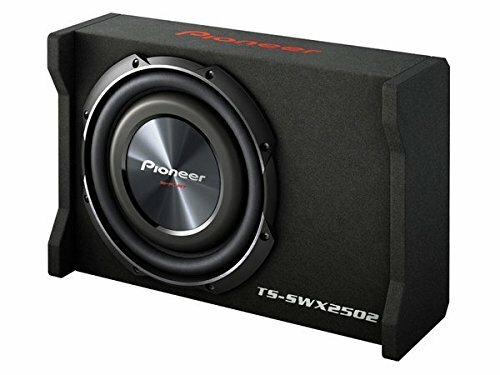 Pioneer TS-SWX2502 10-inch Shallow-Mount Pre-Loaded Enclosure gives you the taste of oversized cone performance in a compact body. Besides, the power handling and the frequency response range disclose a lot about its ability. With features like this subwoofer's, you're guaranteed to have a great time. Our goal is to bring you some of the best names and this is exactly what we're trying to accomplish here. Kenwood is a trusted name in the homes of numbers of users, and it has been made possible only because of their quality service. Yup, we have another Kenwood subwoofer to look out for. Well, since they have so many good options, why not? Arrangement for small space? It says it all in the name! COMPACT SUBWOOFER! That's right, the body is pretty compact which gets along with all areas. You can install the speaker anywhere you like. Your car has space, that piece of information is enough for the subwoofer. Since this is a powered subwoofer, you won't have to plug in another amplifier to boost the bass; the built-in amplifier takes care of it. Power handling? Just like every other splendid Kenwood model! It works with 75 Watts of RMS and 150 Watts of maximum power. The enclosure is made of solid aluminum making it a rigid system for the long run. Yes, you won't have to worry about replacement for a while; or we can say, for a really long while. A remote bass control is included in the package. You can use it to control the system without getting off the seat. Comes with ground wire harness which makes it easier to install the system in crucial places. However, wiring kit is not included, so that's totally up to you. You can tell from the features that Kenwood Compact Powered Enclosed Subwoofer offers the same quality service as all the other members of big Kenwood family. It's evident that this subwoofer is here to stay. Make up your mind, give this item a chance. We can assure that you won't regret the decision. Kicker is best known for its strong, ground-breaking bass delivery. Now, it's quite a challenge to bring the same outstanding performance when the attire is not the same. But that's least of your worries when Kicker is the brand you're dealing with. Yes, this Hideaway car subwoofer from Kicker is specifically designed for compact area installation. Don't have much room? No problem! This compact body of KICKER 11HS8 8" 150W Hideaway Car Audio Powered Subwoofer Sub Enclosure can fit everywhere. Grab the mounting kit and get started! Even though the body is pretty shallow compared to usual Kicker models, the bass game is still the strongest! It comes with a built-in amplifier, so doesn't require an extra amplifier to boost the frequencies. The amplifier can handle up to 150 Watts of RMS power. It covers a frequency response range of 25-120Hz. The range for variable low-pass crossover is 50-120Hz. Bass response is distortion-free and sounds more spontaneous, all thanks to the subsonic filter that comes along. It eliminates unnecessary frequencies responsible for damages and distortions. The enclosure is sealed and it's made of aluminum which ensures the system's durability and utter rigidity. Metal grilles are included in the front. The subwoofer comes with a wired remote bass control that lets you control the system directly from your seat. You can use rotary dial for adjusting crossover frequency and bass boost level. As we said earlier, bringing quality sound everywhere is never too difficult for Kicker. They have dedicated themselves to provide you with the best, and that dedication is reflected in every Kicker item. 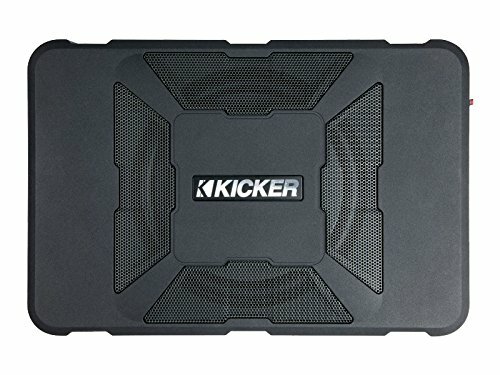 KICKER 11HS8 8" 150W Hideaway Car Audio Powered Subwoofer Sub Enclosure reproduces large-subwoofer like sound without costing you much space. Doesn't that sound like a great deal? Don't know how to do justice to the description of this fantastic subwoofer, but here we go anyway. 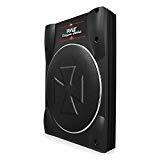 Rockville RW10CA 10" 800-Watt Under-Seat Slim Amplified Car Subwoofer is not here to just play around, this tough sport is here to stay and make you listen to its thundering rage. Exactly, may not seem much compared to gigantic subwoofers, but this Rockville subwoofer is going to rock you for good. The subwoofer can handle up to 200 Watts of RMS and 800 Watts of peak power. Works with 2 ohms impedance and 90dB sensitivity. Covers a frequency response range of 20-150Hz. It's a powered subwoofer. No need to install an extra amplifier to pump up the frequencies, the built-in automated amp takes care of it. Speaking of the automated system, the amplifier shuts down on its own when signal transition stops. The subwoofer is engineered with MOSFET power supply system. In case you don't know how it works, this power supply system enables Metal Oxide Semiconductor Field-Effect Transistors to reproduce high-efficiency response by making a switch between full and non-conduction ways. 2.7" thick enclosure makes the subwoofer a perfect fit for tight spaces. Short protection and thermal protection circuits are included to ensure safe usage. All the outputs and inputs are placed at one side, making a smooth way for wiring. Also, you don't have to remove the receiver in order to mount the enclosure, which is an exception. The best thing about this speaker is the way things are arranged inside for easy installation. It comes with a subwoofer level remote control, giving you the privilege of customizing response just by using your fingertips. However, the control is really not necessary for high-level inputs though, auto turn-on technology covers for them. Have to admit Rockville RW10CA 10" 800-Watt Under-Seat Slim Amplified Car Subwoofer is indeed your ideal subwoofer. For compact space, for quality bass response, for everything. Rockford has a good collection of under seat subwoofers. So, we don't think it'll be a problem to add one more to the list. Besides, what can be better than ending a list with a popular name? 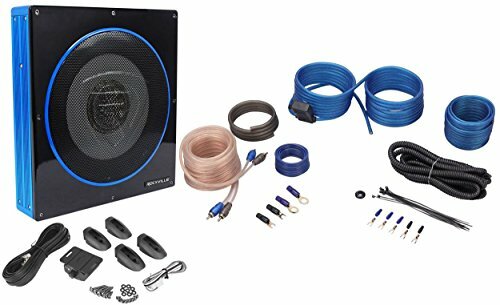 From the outside, Rockford Fosgate PS-8 8" 150W RMS Underseat Powered Car Stereo Audio Subwoofer might look like your everyday not-so-special under seat subwoofer, but its features indicate towards a completely different story. Do we have to mention how well it fits in small areas? Since it already says, 'under seat subwoofer' in the name, I don't think an explanation is necessary. Yup, perfect for every place. It's a powered subwoofer, nothing new in there. What you should know, the built-in amplifier is engineered to amplify sound without putting much force on the system and using less power. You are assured to have a safe subwoofer journey as it includes techs to help with thermal, short circuit and reverse polarity protection. About the enclosure, it's sealed with industrial grade vinyl covering. The vinyl coating protects the subwoofer from external damage. And let's not forget the amazing outlook it provides. It includes remote bass level control for the user's control convenience. So, there you go, ending the review to end the list. As disclosed earlier, we are gonna end the list with a splendid product, and here we are. 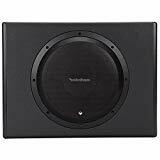 Rockford Fosgate PS-8 8" 150W RMS Underseat Powered Car Stereo Audio Subwoofer is gonna be a spectacular addition to your car stereo system, no doubts for that one. Having Trouble Making Decision? Here's A Guide. Still having dilemmas? We get it, making the right purchase is not always an easy piece of cake. And since we're talking the best under seat subwoofer here, conditions are a bit more complicated. But as always, we got your back. Here are some tips to make it easier for you. When the discussion is about under seat subwoofers, the topic of space has to be discussed. In order to fit under the seat, the subwoofer has to be pretty compact. You just can't pick something random, have to measure the ratio carefully. The under-seat subwoofer should be able to fit tight spaces. Not just what says in the name, it should come with the ability to fit other places as well. Sometimes the area under the seat is not the most preferred location judging from the subwoofer's sound dispersion ability. So, it should include arrangements for the back of the seat, trunk, car doors and other shallow areas. When you read about subwoofers, this doesn't seem like much, but the power handling is the most important thing here. More important than the size and the design. The RMS wattage you see, it decides the loudness of the subwoofer's response. The bass gets louder as the number goes higher. However, in case you're working with an additional amplifier, its capacity has to match your subwoofer's power handling limit. Otherwise, the amplifier won't be able to optimize the sound to an acceptable extent. Or worse, it'll burn your whole system down. Why is this important? The low-end frequency range is vast, and the production capacity differs from one model to another. You can learn the subwoofer's sound playing capacity judging from its frequency response range. The range tells you how deeper or louder the bass can go. So, it's pretty important to learn about a particular subwoofer's frequency response range before making a purchase. We're talking bass performance here! Come one, what was the deal in the first place? Car's factory speakers (or car speakers in general) aren't really great when it comes to bass delivery. Seriously it's not easy to bring such power using drivers like them. That's why an extra subwoofer is required for some extra support. Now, the amplifier is a must to boost those subwoofer frequencies, to bring the taste of actual bass using the car stereo system. We already know how it's inside a car, there's not much space and you have to take that into consideration when you're adding some more equipment to the system. The subwoofer is already compact to save some space, now stashing an extra amplifier alongside seems completely irrational in a situation like this. That's why you should go with powered subwoofer. Despite being small, powered subwoofer still has some room for its built-in amplifier and that's everything. By purchasing this, you get an amplifier and don't even need to sacrifice some space for it, a complete win-win deal. As we said earlier, the frequency range for bass is huge. However, not every frequency is worth it. Some frequencies are below human ear's hearing range and they do nothing better but causing unwanted distortion. Filters are here to save the day. Subsonic filter, low-pass and high-pass filter, you name it! These filters block unnecessary frequencies from causing disturbance and thus help to produce quality bass. Very vital stuff right there! When you're checking out a subwoofer, don't forget to take a look at the arrangement it holds for installation. The mounting can get a bit complicated with the choice of location, but won't occur as a big deal if the subwoofer comes prepared for all the circumstances. The materials, the design - everything related to the enclosure has a great impact on the subwoofer's output. The bass response depends on the structure a lot that one can imagine. The response automatically gets deeper when the enclosure is sealed. Moreover, the room it has for air transition plays a big role in the subwoofer's performance. The outcome of the same signal can be different due to the pace of air flowing inside. The subwoofer needs to be protected both internally and externally. The materials used in manufacturing tells a lot about the arrangement it holds for protection. Sounds crazy, but the benefits are incomparable. Since there are loads of suggestions to choose from, you can always turn to user reviews for some further assistance. You'll be able to decide better whether the subwoofer will be good for you or not from their statements. Since users state their experience with the product, this will make it easier for you to understand its features and make the right choice. Take the tips above under consideration, hopefully taking a decision won't be much of a problem anymore. Here in the end! We hope you're satisfied with everything. We put everything you need to know about your purchase in one place to help you make a better decision. All the possible questions you can have regarding the under-seat subwoofer, have been answered above. We tested and picked only the best under seat subwoofers. And in case you get confused because of all the suggestions, we thought it'd be better to help you out with some tips. All these were done to provide you with a great purchasing experience. You're happy with the outcome? Share your thought in the comment section below.